1. Have a happy Halloween!!! 2. Enter your Halloween recipe by November 6. Halloween is almost here and the excitement is building! Pumpkins are carved, costumes are ready to go - have you worked out what recipe to make for Halloween? For a super fast meal to get the kids in the mood, make fish fingers, chicken fingers, or hamburger fingers, then smother them with ketchup for "bloody" fingers. Make mashed potatoes and serve up two scoops with an ice cream scoop. Add an olive to the center of each scoop of mashed potatoes and serve "creepy eyes". Buy mini pumpkins, cut the top off and scoop out the seeds and goop. Make green Jello gelatin or chocolate pudding. Set the gelatin or pudding in the pumpkins, refrigerate, then serve. Keep it simple and have a BLAST! Eeek...Spiders! recipe by Chase, age 6. Great news! I've increased the prizes for the Halloween recipe contest. First prize winner will now receive a $200 gift card and second prize winner will receive a $100 gift card. The recipes entered so far have been very creative, fun, and colorful. 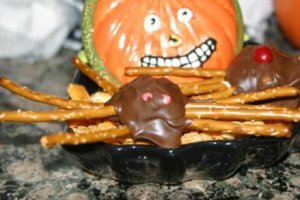 Recipes have come from both adults and kids (see Chase's recipe for chocolate spider pretzels). There are super sweet treats and also some healthy Halloween recipes - so have a look. And don't forget to snap a picture of your recipe on Halloween, then send it in for a chance to win a prize. Be sure and get your recipe in by November 6. Click here for more contest details and to check out the recipes. Happy trick or treating and have a fun Halloween!